The Trading Cube is a snapshot view of the qualified trends for a stock, stock sector and the general market. It visually describes the technical health from a trending perspective. Trends have life cycles just like any household product from a light bulb to a microwave oven. In a similar way to other products, qualified trends life cycles can be estimated with the same engineering precision of mean-time-to-failure (MTTF). This short article describes the process. In his book, Trend Trading Set-Ups (published by John Wiley & Sons), L.A. includes quite a bit of discussion on MTTF and how it can be used as a useful guide in measure the probability of trend continuance. The failure part of MTTF can be defined differently and eventually there will exist multiple MTTF estimates but initially on the simplest of the MTTF calculations is included as shown and described below. In the Trading Cube there are qualified trends for the stock, the stock's sector and the general market across three time frames. Essentially this is a snapshot view of 9 charts in one compacted view. In addition to qualified trends, there is a measure of cumulative MTTF for each of these qualified trends. For a trend to "fail" it must transition and the MTTF value shown for each qualified trend is a cumulative probability of that qualified trends failure rate at that particular point in time. 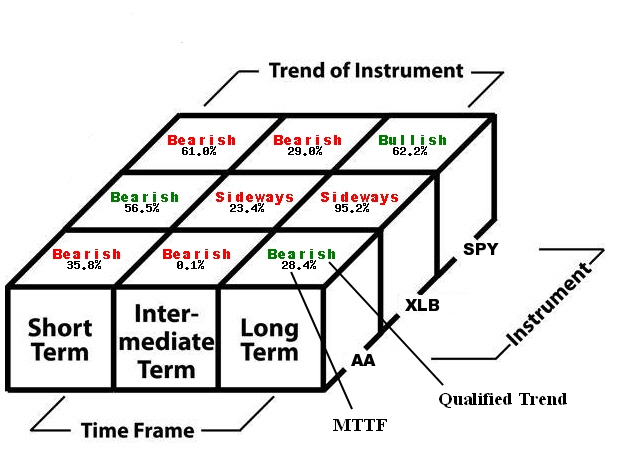 MTTF is measured in terms of bars (time) and according to the trend time (suspect or confirmed). The slope (speed of the failure probability curve) can be examined by clicking on the MTTF value you see on the Trading Cube. A pop-up will appear showing the current MTTF probability and how fast/slow that cumulative probability will increase over time (bars).